Zeeland (also called Zealand) is a province in Netherlands. It is on the south-western part of the country. About 380,000 people live in this province. Zeeland is a good example of land partly reclaimed from water or marshes. It is a large river delta at the mouth of several major rivers. Most of the province lies below sea level and was reclaimed from the sea. What was a muddy landscape, flooding at high tide and reappearing at low tide, became a series of small man-made hills that stayed dry. The people of the province connected the hills by making dikes. This made a chain of dry land which grew bigger, and gave the province its present shape. The North Sea flood of 1953 swamped vast amounts of land. Building the protective Delta Works also changed the face of the province. Dams, tunnels and bridges are a vital part of the province's road system. The final touch to this process came in 2003 when the Western Scheldt Tunnel was opened. It was the first solid connection between both banks of the Western Scheldt and ended the era of water separating the islands and peninsulas of Zeeland. 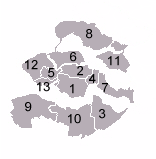 Location of the municipalities of Zeeland. Wikimedia Commons has media related to Zeeland. This page was last changed on 23 January 2018, at 15:18.